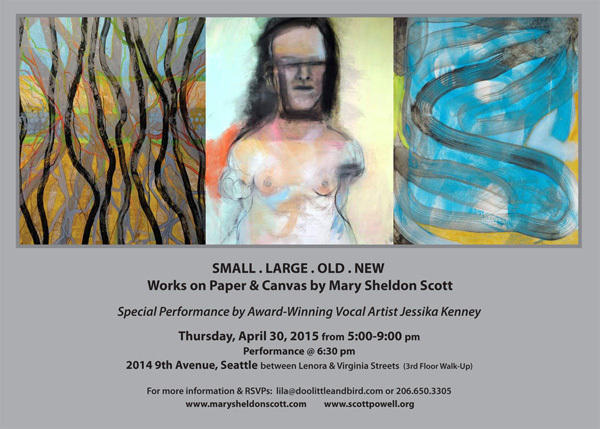 Join us for a showing of gorgeous works on paper and canvas by Mary Sheldon Scott (Molly), with a special intimate vocal performance by the equally amazing Jessika Kenney. Mary Sheldon Scott creates internal and external landscapes filled with luminous textures and intense color. Drawn to the place where accident and action meet, she is increasingly engaged in underscoring visual tension between the raw and the refined, between the organic and the decorative. Her dynamic investigation of materials on canvas and paper includes acrylic paint, sumi-e ink, pencil, pastels, markers, collage, and glitter glue. The Beebe Studio is a third-floor walk-up between Lenora & Virginia Streets. We’re happy to be helping the iconic and influential Pat Graney Company shore up support for their creative work and arts education activities, including the 20th year of their vital program for incarcerated women, Keeping the Faith/The Prison Project! We’ll be at Center on Contemporary Art (CoCA) next Thursday, April 16 from 6-9pm giving artists feedback on their portfolios. It’s great for artists applying for grants or public art projects, looking to expand networking skills, wondering what to actually put in their portfolio or website, or seeking professional feedback on a new body of work. Come get valuable feedback on how you present your work!